At bedtime, under a blue mosquito net, two boys lie on a mat and whisper secrets from the day just passed. Six-year-old Thon Mayom falls asleep quickly. He is exhausted from two sessions that day to treat a worm emerging from his knee. His 5-year-old brother, Mawut, drifts off to sleep too. His job is to look after his big brother during the difficult treatment. 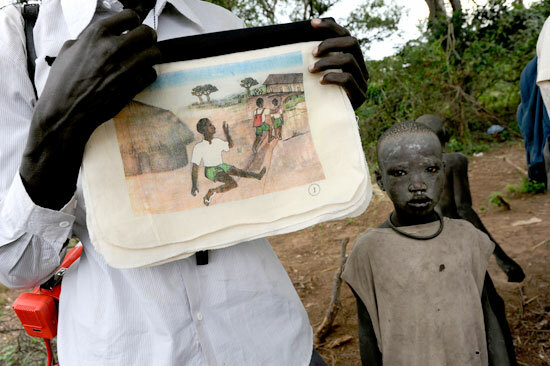 The brothers are sleeping at a case containment center for victims of Guinea worm disease in Abuyong, Southern Sudan, an isolated rural outpost. Staff from the Southern Sudan Ministry of Health and The Carter Center provide in-patient treatment here to people suffering from the parasitic disease. This region represents one of the few remaining pockets of Guinea worm disease in the world, following a 25-year campaign led by The Carter Center to eradicate the scourge. Mayom unknowingly contracted the disease a year earlier after he drank Guinea worm–infected water fleas that eventually - in the human body - develop into spaghettilike worms up to 3 feet long. Once mature, a worm will emerge from its victim, forming a painful wound on the skin. Mayom's worm appeared below his right knee, and the sore became badly infected. "It was too painful to walk," Mayom said. Nurses often had to carry him to a mat where he could rest following treatment. For treatment, patients at the case containment center gather under an outdoor pavilion where manager Julius Obyayas and nurse John Lotiki tend to them one by one. It is painstaking work to extract a Guinea worm. When the worm first emerges, a health worker will begin wrapping it around a piece of gauze, continuing each day for several weeks until the worm is extracted. A worm that is pulled too much at once could break, possibly resulting in permanent disability for the victim if part of the worm is left inside the body. Mayom suffered through another worm a year ago in his ankle. But this one may be his last. In 2010, there were only about 1,800 cases of Guinea worm disease left in the world, and the vast majority were in Southern Sudan. The number of cases in 2010 was down by about 44 percent over 2009. 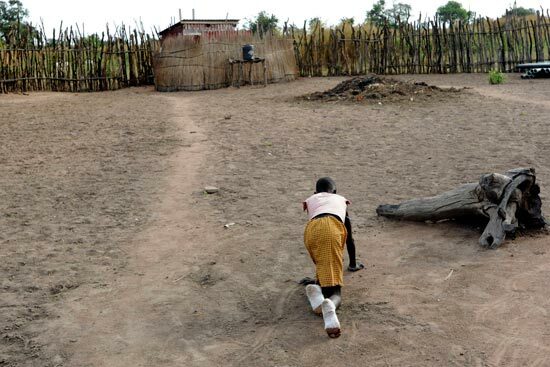 At this point, "the greatest threat to the eradication campaign is renewed fighting in Southern Sudan," said Dr. Ernesto Ruiz-Tiben, director of the Center's Guinea Worm Eradication Program. For now, Mayom endures his treatment as best he can. His brother tries to distract him with games and funny stories, but the pain of treatment often leaves him listless. Mayom's father worries about him and sent other siblings to check on the boy. "I wouldn't want my brothers or sisters to get this disease," Mayom said. Thon Mayom rests between sessions to treat his Guinea worm disease. Mayom's sister Amer (left) visited the case containment center to check on her brother. 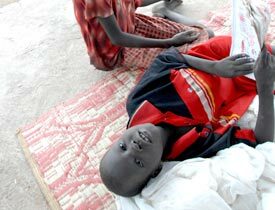 Nyawut Reec Dhala, age 12, another young patient at the Abuyong case containment center, crawls toward the latrine following treatment for seven Guinea worms in her legs and feet. Emerging worms are so painful that they can temporarily cripple their victims. Mayom assists nurse John Lotiki, who tends to Mayom's badly infected Guinea worm wound. In addition to treatment, Guinea worm disease sufferers and their community members receive health education to help them understand how Guinea worm disease is transmitted and how it can be prevented.